This feels so weird writing this as I haven’t done so since 2015. To get the ball rolling, I thought it would be good to start with a quick update of my current system. As you can see Iris is still my primary system. However I’ve also expanded to other things outside of Iris and I plan on sharing what works in my home in future posts. Looking forward to the rest of 2017 as I plan on being more active on this blog and at the forum. Sorry everyone for my lack of posting. I’ve been deep into the street safety issue and recently our world has been spinning. For those who have been following this blog would know that my three year old daughter died last year when a driver ran over her. Recently we received shocking news that the driver who received two TRAFFIC TICKETS for “Failure to yield” and “Failure to use due care” was dropped by the DMV when they have video evidence that the driver is guilty of these charges. I’m asking today if every can please sign the petition at change.org and if you can share it with your friends and family, so we can find justice for my daughter and MAKE changes at the DMV. Dad got diaper duty so he’s not doing so well, and will be submitting a feature enhancement for Iris. Big brother thinks Aidan is slowing him down from catching his Pokemon. Enhancement Ideas for Lowe’s Iris Contest! To help encourage readers to subscribe to this blog or follow my tweet. I’ve decided to startup a contest to find out what you think will make Lowe’s Iris better. The contest starts now and you can submit as many times as you like until April 21 at 12pm eastern. I’ll post the 10 best ideas on April 23 and ask readers to comment for their favorite until April 28. Top three winners will be chosen on April 30th. I finally decided to jump on board to the twitter bandwagon and give it a good shot. I’m personally a Facebook guy but decided to try something different and hopefully learn a thing or two from it. So please follow me at @LivingWithIris where I’ll be tweeting things I’m working on in between posting. See you there! Sorry everyone but this post won’t be about Iris but a personal message regarding street safety and driving. Today would have been my daughter 4th birthday and forever be a difficult one to deal with. For those who doesn’t know you can hear what happen from my interview with WNYC radio regarding the tragic day on October 6 2013. For our family this is a constant reminder on how fragile life is and how much we need to change the driving culture. Too many people are driving while distracted, texting, talking on the cell phone, speeding, DWI, and etc…. Just in New York City every 33 hours someone dies in traffic violence, and every year in New York City 70,000 people are injured by a vehicle and they are considered lucky. I’m not sure about you but I don’t know how lucky it is to be missing limbs and having fracture skulls. So next time when you drive please also remember to pause. Ask. Is it worth it? Interesting article, It seems like there is a large interest in having a wireless security or security camera system but very little do. Also only 10% of people like to do install this themselves and the rest like to have someone else to this for them. 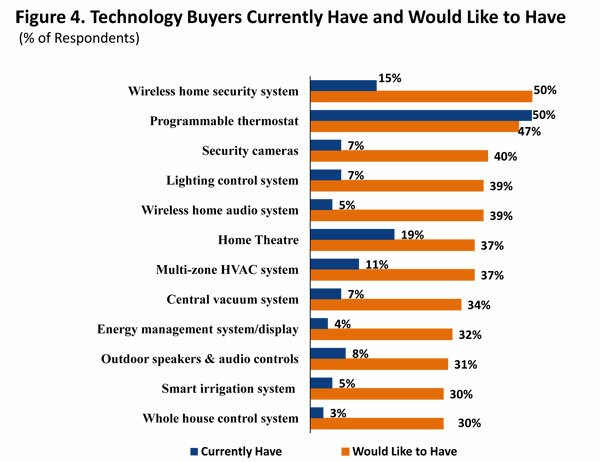 NAHB recently released What Home Buyers Really Want, a report aimed at providing our members the most current and accurate information on home buyer preferences so that they can deliver the home (and community) that today’s buyers want and are willing to pay for. The findings are based on a detailed survey undertaken by the Economics and Housing Policy Group in 2012.